Download our Skype extras and plugins to get even more from your Skype. 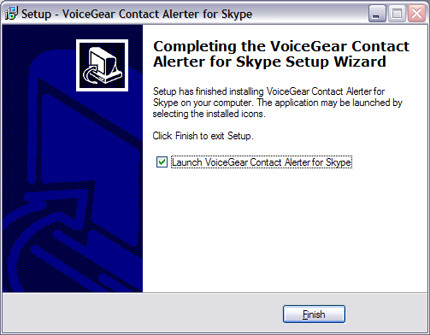 VoiceGear Contact Alerter for Skype is a Skype Extra that lets you stay informed whenever your Skype contacts change their online status. 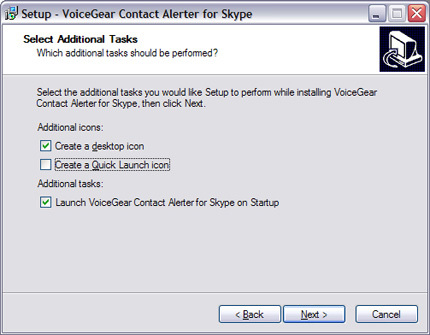 Using VoiceGear Contact Alerter for Skype plugin you can enable custom alerts for every Skype status. 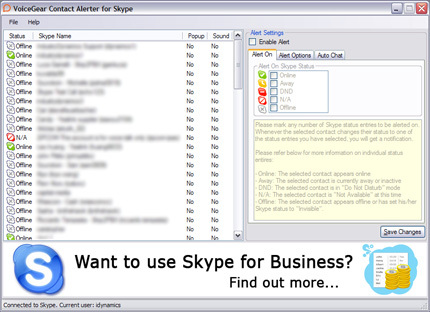 Anytime your Skype contact switches status you can be notified with a popup window or a sound alert. 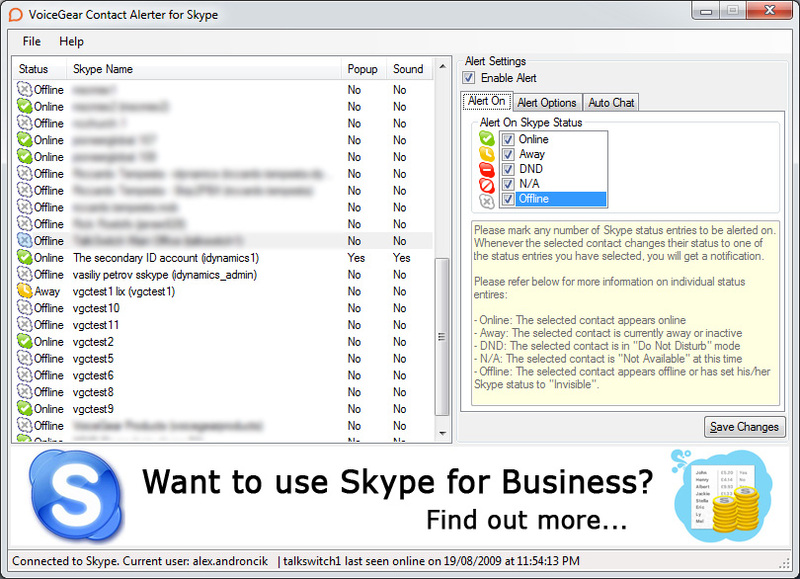 Want to chat with your offline Skype contacts and keep checking when they come online? Need to set a quick reminder to confirm meeting time with your Skype buddy? 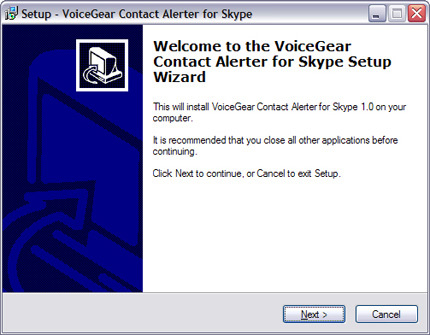 Welcome to VoiceGear Contact Alerter for Skype! Using this free plugin you can enable individual status notifications, set quick reminders and easily check when your Skype contact was last seen online. VoiceGear Contact Alerter for Skype is a freeware Skype Extras plugin which helps you stay in touch with all of your Skype contacts no matter whether they are friends, colleagues, customers or business partners. 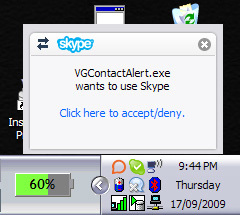 VoiceGear Contact Alerter for Skype lets you select for which of your Skype contacts you would like to receive status notifications when they change their online Skype status. You can even define individual Skype status for which notifications will be presented. Ever wanted to say something to your friend or colleague, but they are Away, Not Available or in Do Not Disturb mode and you have to run out? Well, now you can. Simply enable a contact alert for your Skype buddy and type in a chat message. Your chat message will be sent to your contact whenever they switch their Skype status to Online. 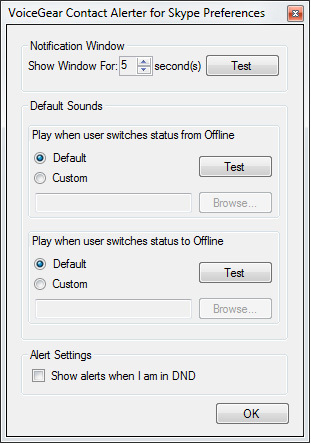 You can choose between text popup and/or sound alerts for status notifications. You can switch between static and fading popup messages or define your custom sound to be played whenever your contact alert is triggered. Use VoiceGear Contact Alerter for Skype to set individual contact reminders. Contact reminders will show up as text popups whenever your contacts change their online status. 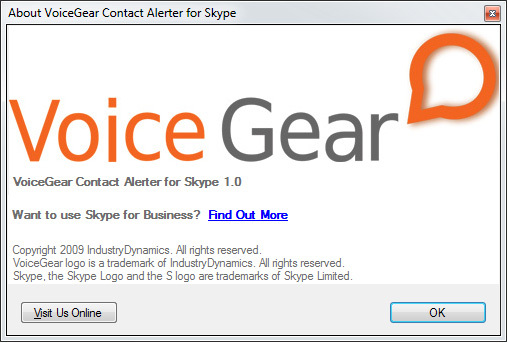 Using VoiceGear Contact Alerter for Skype you can easily view the last time your contact was seen online. This can be especially useful when planning an occasional chat or a follow up call with your business partners or customers, who you don't speak to on a regular basis. Use VoiceGear Contact Alerter for Skype installation package (.sparc file) which is available on Skype Extras site. Use setup.exe file, which can be downloaded by clicking on the banner above. 2. Select "I accept the agreement" and click Next button. 3. Click Next button to continue. If you would like to select custom installation directory, click Browse button. 4. Click Next button to continue. 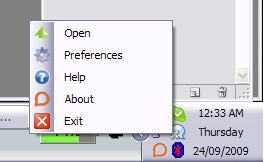 If you would like to select a different Start Menu folder, click Browse button. 5. 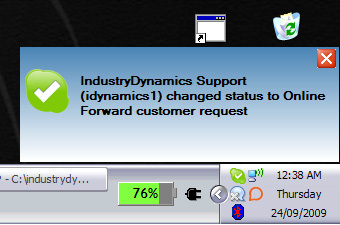 Select any additional tasks you would like to be automatically performed after installation. Click Next button to continue. 6. Review installation settings and click Install to continue with the installation, or click Back if you want to change any settings. 7. Installation of VoiceGear Contact Alerter for Skype is complete. Click Finish to exit the setup wizard. 8. 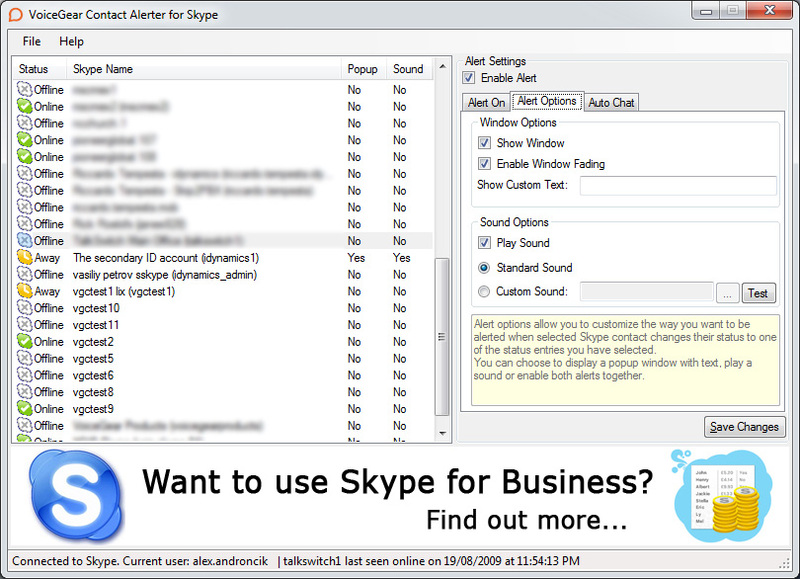 If your Skype client is running, you should see a popup window appear from the task bar area. Click on "Click here to accept/deny". 9. If your Skype client is not running, start up and sign into your Skype account. You should see a new Plugin authorization event in the events area. Click on the event. 10. 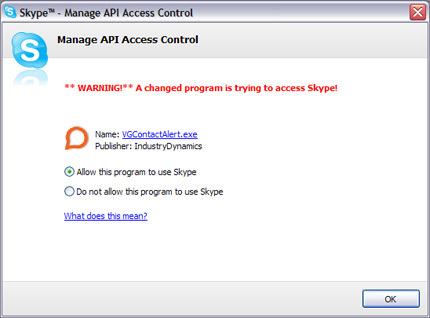 Your Skype client will display a "Manage API Access Control" dialog. 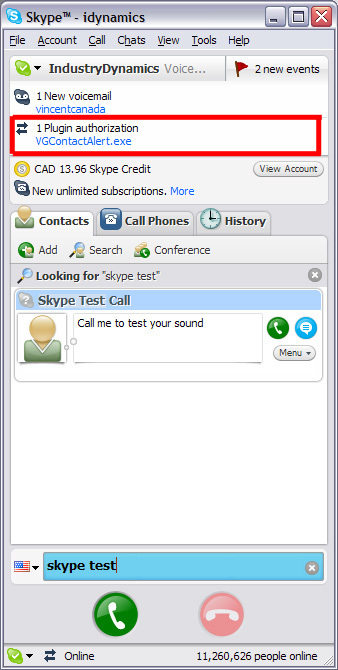 Select "Allow this program to use Skype" option and click OK.
11. VoiceGear Contact Alerter for Skype is connected to Skype and should display your list of contacts. 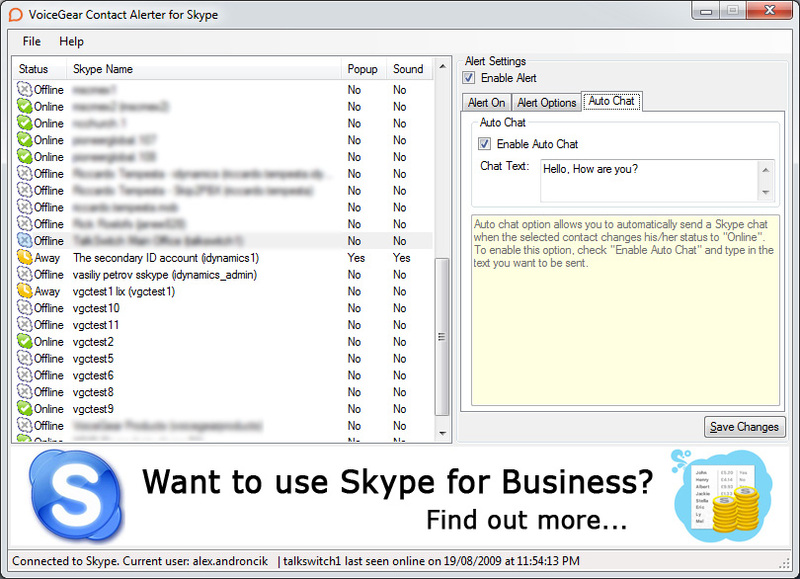 We are always looking for ways to improve our Skype plugin software, your feedback is very important to us.